FIFA votes against Palestinian Authority demand for sanctions, promises to open disciplinary proceedings against PA football chief. 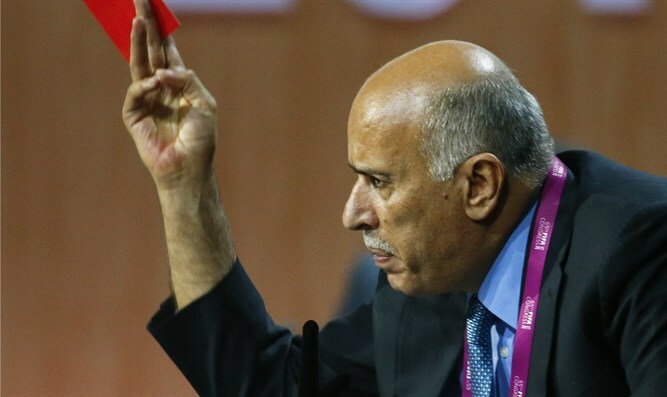 The 68th FIFA Congress rejected out of hand (82% vs 18%) Palestinian Football Association (PFA) President Jibril Rajoub's demand to sanction and suspend countries which have violated citizens' rights. The Congress also noted that similar sections are already included in their rules, and the PFA's suggestion is therefore extraneous. FIFA also told the Israel Football Association (IFA) of its decision to open a disciplinary process against Rajoub, due to his verbal incitement prior to the planned game with Argentina. In his speech, Rajoub encouraged burning Messi shirts if he played in Israel, and compared modern Israel to Nazi Germany. The Argentina-Israel match was canceled after terrorist organizations sent messages and threats to the team’s players and their families, with explicit threats to harm their lives and their family's lives. FA Chairman Ofer Eini said, "This is a recurring ritual in which Rajoub attempts to lead FIFA decisions against our football [teams] and against the State of Israel." "Thanks to proper and thoughtful work, we succeeded in explaining to FIFA members what the motivating factor behind these apparently innocent suggestions are, and that the person suggesting them has crossed every red line. "We have a true friend in FIFA...and therefore Rajoub fails time after time. Israeli football will continue to be part of the international community, and the State of Israel will continue to enjoy support in the world football association.